This page showcases schools and other education-based programs that implement innovative practices and serve children and youth who are involved, or at risk of involvement, with the juvenile justice and/or child welfare systems. All three TIPD coordinators who contributed to the coordinator series stress how vital collaboration was to their work overseeing TIPD activities within their respective States. In Part III of the coordinator series, TIPD coordinators reflect on the importance of data collection to their role as TIPD coordinators. In Part II of the series, TIPD coordinators describe their role in providing professional development (PD) to the individuals, programs, and facilities (grantees) who receive TIPD funds. In Part IV of the coordinator series, TIPD coordinators reflect on their monitoring practices. Highlights the site-based mentoring and mentor training used in an Arizona program geared towards guiding boys aged 13-17 toward a healthy manhood. Features an evidence-based program that has thrived for almost 20 years in providing various high quality mentoring services to incarcerated youth who are at high risk. Explores a reentry program directed at supporting incarcerated youth by providing mentors as role models and focusing on addressing key obstacles to reentry, employment and education. 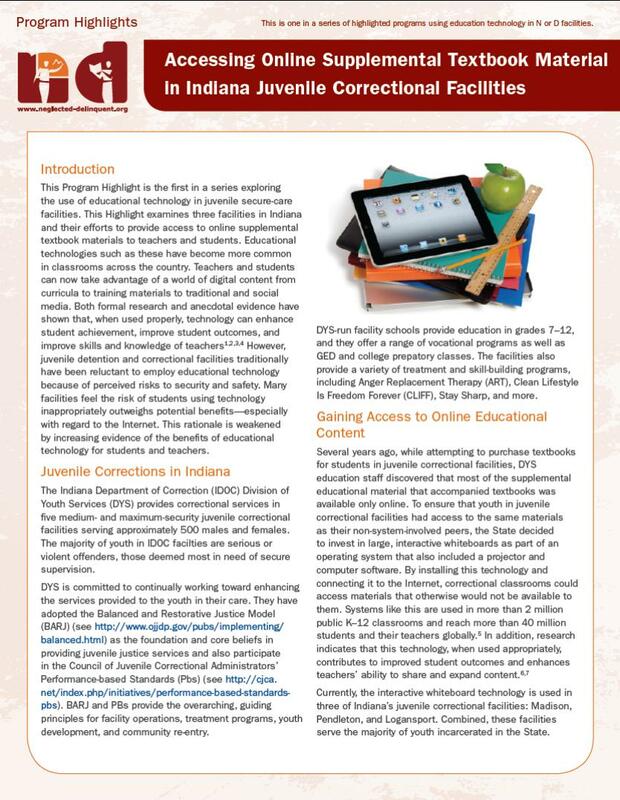 Examines the efforts of juvenile correctional facilities in Indiana to provide access to online supplemental textbook materials to teachers and students. 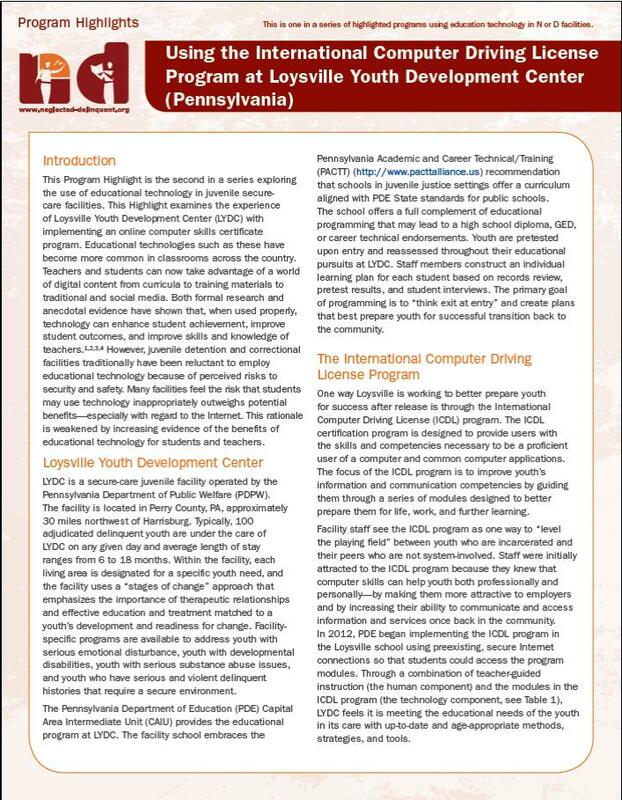 Highlights the Loysville Youth Development Center’s implementation of an online computer skills certificate program to help prepare their students for employment. 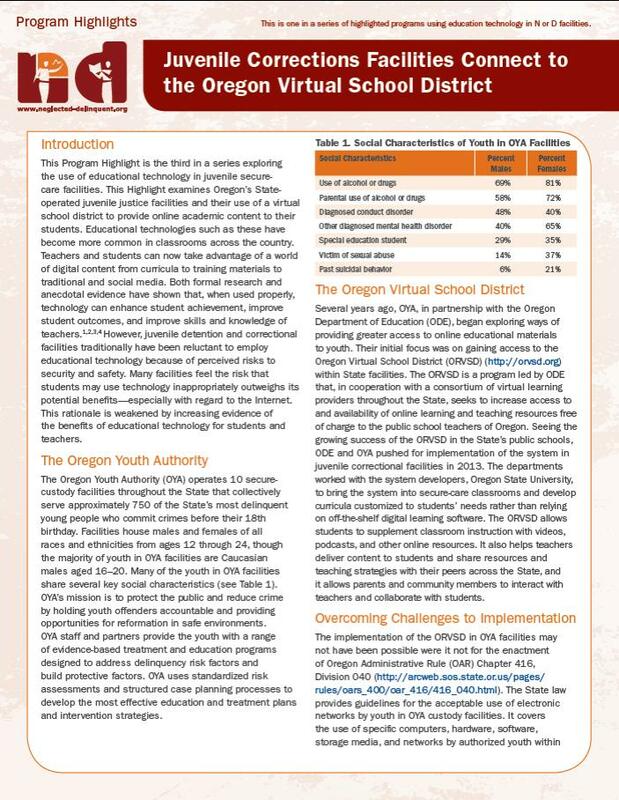 Explores the use of a virtual school district in Oregon's State-operated juvenile justice facilities’ that provides a continuum of online academic content to keep their students on track. Highlights programs at Stadium View, a short-term stay school in the Juvenile Detention Center, which includes family involvement, literacy education and transition support services. Discusses Washington State’s 2004 pilot transition program, subsequently expanded across the State, to serve both system-involved youth and prevention services. Provides an overview of this unique dropout recovery school district, with a middle and high school that provides credit recovery options as well as academic, health, and social services for its youth. Features the Transition Specialist Program, implemented to address the difficulties youth can experience transitioning between the juvenile justice system and the general education setting. Features the educational and support services provided in this alternative learning environment set within a residential treatment facility in Greene County, Arkansas. Highlights the Northern Virginia Juvenile Detention Center’s approach to education through co-teaching, project-based learning, and supplemental services.